The profession version of the program can synthesize speach. The commercial version LMBpro has additional possibilities in comparison with LMBomber. The build-in synthesizer of speech allows listening the text in native and foreign languages. 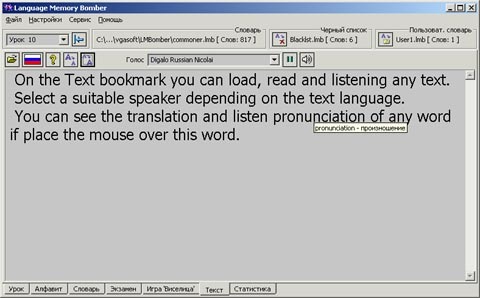 It allows you to work and listening words in a background. You can listening current word and translation in the "Exam"
The commercial version costs only $9.95. Для жителей России и стран ближнего зарубежья стоимость коммерческой версии снижена до 250 руб. Пожалуйста, ознакомьтесь со способами оплаты. Pay the program any way convenient for you. Variants of payment are described here. You will are received a password and URL of www page with commercial version. Need to download and install the speach modules.